The first 10 each year are FREE, but always make sure you have enough for your salespeople, and order any additional ones as needed. Increase your sales by letting the customers see and feel the items they want to purchase. The durable demonstrator case attractively displays 21 pieces of cutlery. The sampling pack is perfect to introduce a few items to members of your group who will be selling. This pack is helpful for anyone unfamiliar with Rada Cutlery to give them a better understanding of the product they’ll be selling. This pack is great for simplified fundraisers – you can sell Vegetable Peelers or Regular Paring Knives in plastic tubes with rubber caps from our cardboard carrying cases. Promote your fundraiser with this attention-getting 22″ X 17″ poster! Use this 9” x 12” magnet to let people know, no matter where you go, that they can buy Rada Cutlery from you. Remove and clean the magnet occasionally to prevent sticking. High-quality t-shirts with the Rada Cutlery logo to show people you’re excited about selling Rada Cutlery knives and utensils! This unit is great for displaying AND storing your Rada Cutlery items. Simply remove the box lid, insert the cardboard riser, price cards, and banner as shown in the picture. The fasted way to make an attractive table display that stands out is with our table runner. Simply place it across the table so that the logo hangs down in the front or behind the table as a backdrop. 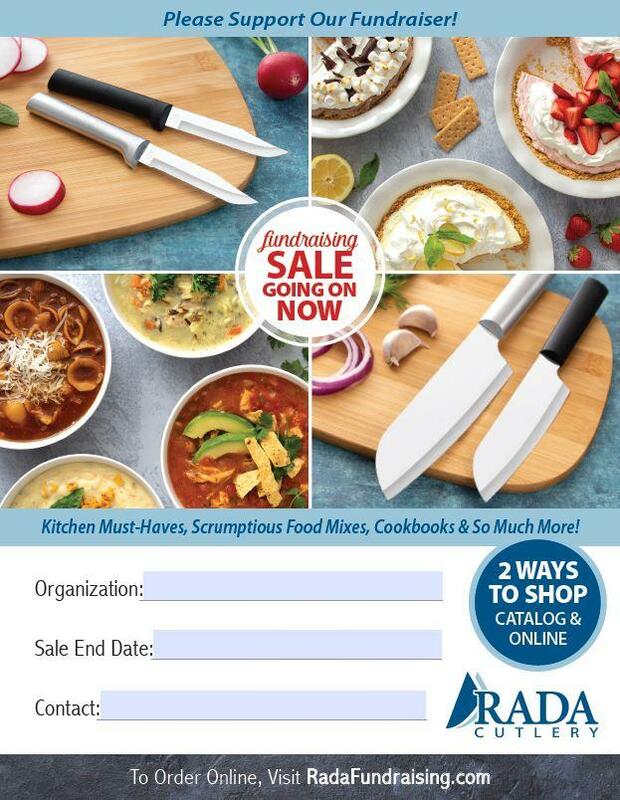 Show your potential customers how affordable Rada Cutlery is with our Price Card (3.5′ x 4.75′). Display boxes are great to add polish to a table set up. Each display box includes an internal smaller box to display a knife out of the bag as well as a price card. Use this poster to inform your community of your fundraiser! Always remember, we are just a phone call away to help you!